Lymphomas are a group of cancers in which cells of the lymphatic system become abnormal and start to grow uncontrollably. Because there is lymph tissue in many parts of the body, lymphomas can start in almost any organ of the body. 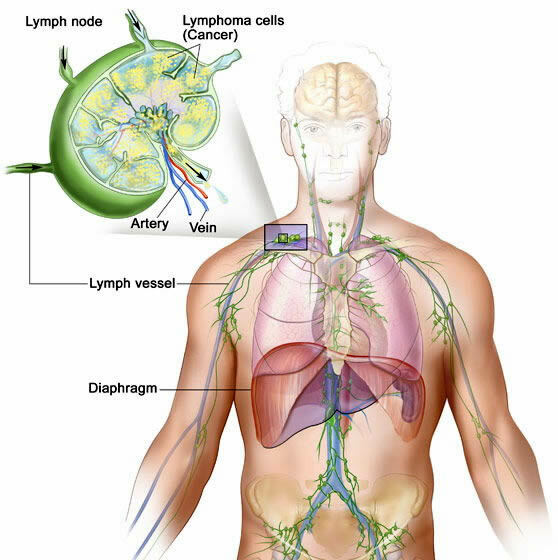 The lymphatic system is made up of ducts or tubules that carry lymph to all parts of the body. Lymph is a milky fluid that contains lymphocytes. These, along with monocytes and granulocytes make up the leukocytes, or white blood cells, the infection-fighting and reparative bodies in the blood. Small pea-shaped organs found along the network of lymph vessels are called lymph nodes; their main function is to make and store lymphocytes. Clusters of lymph nodes are found in the pelvic region, underarm, neck, chest, and abdomen. The spleen (an organ in the upper abdomen), the tonsils, and the thymus (a small organ beneath the breastbone) are also part of the lymphatic system. Lymphocytes are held within the lymphoid tissue until they join the flow of lymph through the node. There are two main types of lymphocytes: the T cell and the B cell. Lymphomas develop from these two types. B-cell lymphomas are more common among adults, while among children, the incidence of T- and B-cell lymphomas are almost equal. The T and the B cells perform different jobs within the immune system. When an infectious bacterium enters the body, the B cells make proteins called antibodies, which attach themselves to the bacteria, and flag them for destruction by other immune cells. The T cells help protect the body against viruses. When a virus enters a cell, it generally produces certain proteins that it projects onto the surface of the infected cell. T cells recognize these proteins and produce cytokines to destroy the infected cells. Some cytokines attract other cell types, which can digest the virus-infected cell. T cells can also destroy some types of cancer cells. Lymphomas can be divided into two main types: Hodgkin’s and non-Hodgkin’s. There are at least 10 types of non-Hodgkin’s lymphomas that are grouped (staged) by how aggressively they grow: slow growing (low grade), intermediate growing, and rapidly growing (high grade); and how far they spread. Most non-Hodgkin’s lymphomas begin in the lymph nodes; about 20% start in other organs, such as the lungs, liver or gastrointestinal tract. When lymphomas begin, malignant lymphocytes multiply uncontrollably and do not perform their normal functions, which affects the body’s ability to fight infections. In addition, malignant cells may crowd the bone marrow, and, depending on the stage, prevent the production of normal red blood cells, white blood cells, and platelets. A low red blood cell count causes anemia, while a reduction in the number of platelets makes the person susceptible to excessive bleeding. Cancerous cells can also invade other organs through the circulatory system of the lymph, causing those organs to malfunction. The exact cause of non-Hodgkin’s lymphomas is unknown. In general, males are at a higher risk than females, and the risk increases with age. Though it can strike people as young as 40, people between the ages of 60 and 69 are at the highest risk. People exposed to certain pesticides and ionizing radiation have a higher-than-average chance of developing this disease. For example, an increased incidence of lymphomas has been seen in survivors of the atomic bomb explosion in Hiroshima, and in people who have undergone aggressive radiation therapy. People who suffer from immune-deficient disorders, as well as those who have been treated with immune-suppressive drugs for heart or kidney transplants, and for conditions such as rheumatoid arthritis and autoimmune diseases, are at an increased risk for this disease. Some studies have shown a loose association between retroviruses, such as HTLV-I, and some rare forms of lymphoma. The Epstein-Barr virus has been linked to Burkitt’s lymphoma in African countries. However, a direct cause-and-effect relationship has not been established. The symptoms of lymphomas are often vague and nonspecific. Patients may experience loss of appetite, weight loss, nausea, vomiting, abdominal discomfort, and indigestion. The patient may complain of a feeling of fullness, which is a result of enlarged lymph nodes in the abdomen. Pressure or pain in the lower back is another symptom. In the advanced stages, the patient may have bone pain, headaches, constant coughing, and abnormal pressure and congestion in the face, neck, and upper chest. Some may have fevers and night sweats. In most cases, patients go to the doctor because of the presence of swollen glands in the neck, armpits, or groin area. Since all the symptoms are common to many other illnesses, it is essential to seek medical attention if any of the conditions persist for two weeks or more. Only a qualified physician can correctly diagnose if the symptoms are due to lymphoma or some other ailment. Like all cancers, lymphomas are best treated when found early. However, they are often difficult to diagnose. There are no screening tests available, and, since the symptoms are nonspecific, lymphomas are rarely recognized in their early stages. Detection often occurs by chance during a routine physical examination. When the doctor suspects lymphoma, a thorough physical examination is performed and a complete medical history taken. Enlarged liver, spleen, or lymph nodes may suggest lymphomas. Blood tests will determine the cell counts and obtain information on how well the organs, such as the kidney and liver, are functioning. A biopsy (microscopic tissue analysis) of the enlarged lymph node is the most definitive way to diagnose a lymphoma. Once the exact form of lymphoma is known, it is then staged to determine how aggressive it is, and how far it has spread. This information helps determine the appropriate treatment. The doctor may also perform a bone marrow biopsy. During this procedure, a cylindrical piece of bone—generally from the hip—and marrow fluid are removed. These samples are sent to the laboratory for examination. Biopsies may also be repeated during treatment to see how the lymphoma is responding to therapy. Conventional imaging tests, such as x rays, computed tomography scans (CT scans), magnetic resonance imaging, and abdominal sonograms, are used to determine the extent of spread of the disease. Lymphangiograms are x rays of the lymphatic system. In this procedure, a special dye, called contrast medium, is injected into the lymphatic channels through a small incision (cut) made in each foot. The dye is injected slowly over a period of three to four hours. This dye clearly outlines the lymphatic system and allows it to stand out. Multiple x rays are then taken and any abnormality, if present, is revealed. In rare cases a lumbar puncture (spinal tap) is performed to see if malignant cells are in the fluid that surrounds the brain. In this test, the physician inserts a needle into the epidural space at the base of the spine and collects a small amount of spinal fluid for microscopic examination. Non-Hodgkin’s lymphoma is a life-threatening disease, and a correct diagnosis and appropriate treatment with surgery, chemotherapy, and/or radiation are critical to controlling the illness. Acupuncture, hypnotherapy, and guided imagery may be useful tools in treating the pain of lymphomas. Acupuncture uses a series of thin needles placed in the skin at targeted locations known as acupoints; in theory, this harmonizes the energy flow within the body, and may help improve immune system function. In guided imagery, patients create pleasant and soothing mental images that promote relaxation and improve their ability to cope with discomfort and pain. Another guided-imagery technique involves creating a mental picture of pain. Once the pain is visualized, patients can adjust the image to make it more pleasing, and thus more manageable. Herbal remedies, such as Chinese herbs and mushroom extracts, may also lessen pain and promote relaxation and healing. Some herbs, such as ginger, are effective in the treatment of nausea caused by chemotherapy, and others, such as astragalus, help build the immune system. Check with an herbal practitioner before deciding on treatment. Depending on the preparation and the type of herb, the remedies may interfere with other prescribed medications. Naturally, any other activities that promote well-being, such as exercise, stress reduction, meditation, yoga, t’ai chi, and qigong will also benefit the patient. Proper nutrition and some specialized diets may help in recovering from lymphomas. Treatment options for lymphomas depend on the type of lymphoma and its stage. In most cases, treatment consists of chemotherapy, radiation therapy, or a combination of the two. Chemotherapy uses anticancer drugs to kill cancer cells. In non-Hodgkin’s lymphomas, combination therapy, which uses several drugs, has been found more effective than single-drug use. Treatment usually lasts about six months, but in some cases may be as long as a year. The drugs are administered intravenously (through a vein) or given orally. If cancer cells have invaded the central nervous system, then chemotherapeutic drugs may be instilled, through a needle in the brain or back, into the fluid that surrounds the brain. This procedure is known as intrathecal chemotherapy. Radiation therapy, where high-energy ionizing rays are directed at specific portions of the body, such as the upper chest, abdomen, pelvis, or neck, is often used for treatment of lymphomas. External radiation therapy, where the rays are directed from a source outside the body, is the most common mode of radiation treatment. Bone marrow transplantation is being tested as a treatment option when lymphomas do not respond to conventional therapy, or when the patient has had a relapse or suffers from recurrent lymphomas. There are two ways of doing bone marrow transplantation. In a procedure called allogeneic bone marrow transplant, the donor’s marrow must match that of the patient. The donor can be a twin (best match), sibling, or not related at all. High-dose chemotherapy or radiation therapy is given to eradicate the lymphoma. The donor marrow is then given to replace the marrow destroyed by the therapy. In autologous bone marrow transplantation some of the patient’s own marrow is harvested, chemically purged, and frozen. High-dose chemotherapy and radiation therapy are administered. The marrow that was harvested, purged, and frozen is then thawed and put back into the patient’s body to replace the destroyed marrow. A new option for lymphoma patients is peripheral stem cell transplantation. In this treatment, stem cells (immature cells from which all blood cells develop), that normally circulate in the blood are collected, treated to remove cancer cells, then returned to the patient in a process called leukapheresis. Researchers are exploring whether these cells can be used to restore the normal function and development of blood cells, rather than using a bone marrow transplant. Like all cancers, the prognosis for lymphoma patients depends on the stage of the cancer, and the patient’s age and general health. When all the different types and stages of lymphoma are considered together, only 50% of patients survive five years or more after initial diagnosis. This is because some types of lymphoma are more aggressive than other types. The survival rate among children is definitely better than among older people. About 90% of children diagnosed with early-stage disease survive five years or more, while only 60-70% of adults diagnosed with low-grade lymphomas survive for five years or more. The survival rate for children with the more advanced stages is about 75-85%, while among adults it is 40-60%. Although the risk of developing cancer can be reduced by making wise diet and lifestyle choices, there is currently no known way to prevent lymphomas, nor are there special tests that allow early detection. Paying prompt attention to the signs and symptoms of this disease, and seeing a doctor if the symptoms persist, are the best strategies for an early diagnosis, which affords the best chance for a cure.